The perfect "Circuit Guide" for Breaker Circuits and Fuses. Made from durable vinyl and permanent adhesive makes it easy to identify circuits. 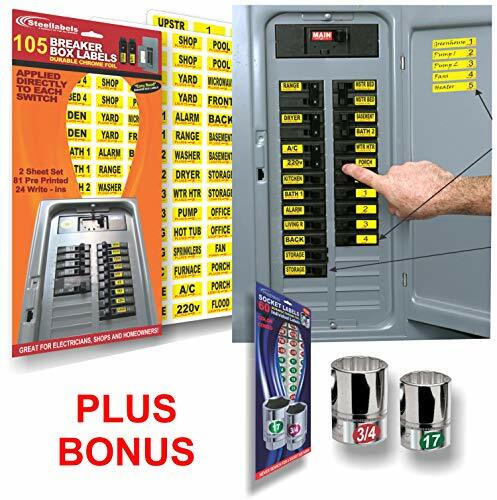 Now with 105 "Easy Read" breaker box labels, you can virtually cover every possible switch and circuit. Color coded for the main breaker and separate labels for plug and lights. Label your appliances and rooms quickly and see them with bright yellow background and high visible lettering. Always know what circuit with useful numbered labels and writable matching ends. Perfect for "Electrician's - Homeowner's - Apartment Units". Now you can label all your sockets, socket rails, nut drivers, and wrenches for "Easy Read" and quick Organizing. See how easy it will be to find those pesky 1/4 Drive Sockets. "You be the Judge" will your sockets be easier to read and organize? Will they be easier to find? Will having them tagged save you time every day of use (and time is money)? Are you looking for the perfect Gift for "The Man who has Everything"? If you have any questions about this product by Steellabels, contact us by completing and submitting the form below. If you are looking for a specif part number, please include it with your message.